UPDATE DECEMBER 2017 - New SPLIT AirConditioner with one head in the bedroom and one in the living room. Other refreshes including 200MBS internet, new living room furniture, desk, and kitchen items. Maui Vista Condos are among the most beautiful on the island and this one surpasses them all. Refurbished, the décor is modern, comfortable and friendly. A ground floor condo it would be suitable for two adults and a school-aged or younger child. You only step away from the famous pristine white sands of Kamaole I and Charley Young beaches. You are mere feet away from a barbecue, as well as several swimming pools. 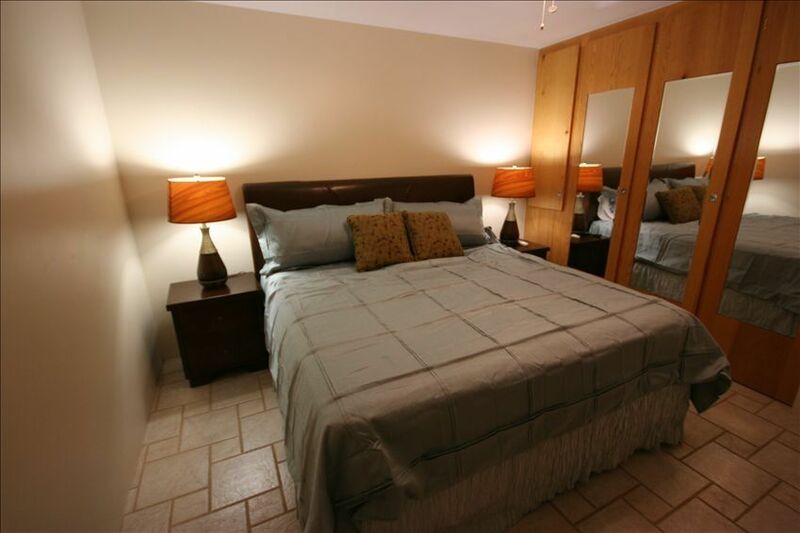 The condo is modern, beautifully furnished and will very comfortably sleep up to four people. The bedroom includes a spacious king-sized bed featuring a Dormia Memory-Foam mattress, a 32' flat panel LED television, and ceiling fans to supplement the air conditioning when the nights are warm. In the living room, you will also find a 50 inch LCD television to entertain you along with a BlueTooth speaker system. The full kitchen features all the small appliances you could wish for. Make a Mai Tai using the blender, or pop some finger food into the microwave. The lounges and chairs on the private lanai will give you plenty of seating if you choose to simply enjoy the sunshine and sip a drink, or a quiet place to relax after a day spent sightseeing or shopping in some of the many fabulous stores and shops. Plus, the many amenities you're going to enjoy will have you returning year after year to this perfect island retreat. You're never far from an amazing view, a beautiful sunset, a fabulous golf course or a wonderful restaurant. Why spend your time in a costly hotel when you could enjoy your vacation your way, with all the comfort and the convenience of home. Your kitchen is modern and convenient and holds all that you need to whip up your own masterpieces of culinary delight, while the dining room features seating for four, or you may choose to eat al fresco, using the table for four on the lanai. Complete with a Bosch washer and dryer, a hairdryer as well as lounge chairs for the beach, all you really need to bring to Maui when you rent this little gem, is your bathing suit, your suntan lotion and you. No vacation could be more perfect than a vacation on Maui, with the wonderful activities such as para-sailing, snorkeling, diving, Zipline, sailing, watching the whales, hiking or riding the volcano or the marine preserve. The only thing that could make it more perfect is this condo at Maui Vista, a central location to nearly anything you can find to do on Maui. You will not find a higher quality unit in the price range. One of only three condos in Maui Vista that uses a Split AC instead of window units. toilet, shower, Walk in shower. Only 500 steps from the fabulous Charlie Young Beach. West Maui mountains and great sunsets. Large lanai leads to grassy open area. (2) Wireless phone in living room and bedroom. Split Air Conditioning (Similar to central air) in living room and bedroom. Ceiling fans also in both. Secure fire-walled Wireless to fast high speed connection. Upgraded kitchen with island glass top stove. Full HD Cable in living room using a 50' LED HDTV and a 37' HDTV in bedroom. Bring your own iPod and use it in either the living room or bed room system. Large dining lanai with seating for four. Watch the sunset while dining. Minimum Age Limit for Renters: 25, unless married. Smoking Not Allowed: Complex has a none smoking rule. Smoking in condo or on Lanai is NOT allowed. Kid Friendly: Three pools and grassy area off Lanai. Kitchen and Bath were totally redesigned. There is nothing like it in Maui Vista. Cable/Satellite TV: Full HD Cable in living room using a 47in LCD HDTV and a 37in HDTV in bedroom. 3 tennis courts and 3 pools, office, security and activities desk (on premises), nearby golf, whale watching, scuba diving, etc. Walking distance to shops and restaurants. Maui Vista has everything you need and is in very close proximity to Kamamole Beach #1. This condo is very well equipped and has a lot of extra's in appliances, kitchen needs, and beach stuff. Additional positive comments are there is zero issues with the wifi, back entrance is in close proximity to parking, and the air conditioner works very well. The only negative comment is the extreme softness of the bed, but that is personal preference. We would definitely stay here again and would recommend it to a friend. Very good value! This is a small unit with everything you need. Great for the price. One large tv and another small in bedroom. Location—just across the street from great beaches; walk to shops; easy drive to grocery store and all else. We like the ground floor so not to have to lug all your stuff, like beach stuff, up and down stairs. Quiet. Lots of little extras such as beach gear, kitchen stuff, books, etc. Some decor is cheesy but overall updated enough. Nice patio. No view but pleasant yard. Good for 2 people. Simple but just fine for us! Wonderful place. Centrally located in Kihei. Everything is available in the condo. Clean and well designed. We totally loved staying with Don! Everything was exactly as shown/stated in his description of the property. The kitchen is remarkably stocked with almost anything you need. Even though this is a large complex, it is so quiet and relaxing (other than the neighbors directly above us who loved to hang their wet swimsuits on the lanai and drip below...LOL!). The location is right across from the beach so no need to get in your car to drive to one. Shops, restaurants, and an ABC Store are all within walking distance, and boy, did we do lots of walking. It was a great stay! We stayed in this condo for a week, then went to a fancy resort for a few nights. I sure wish we had saved our money and stayed here the whole time! The condo was very quiet and had everything we needed and more. Beach chairs, coolers, beach umbrella, snorkel gear, sunscreen, and lots more. The location was perfect. Tons of eating locations in walking distance. Less then a 5 minute walk across the street to Charlie Young beach. This beach (and the Kamole Beaches, which all sort of connect), have the SOFTEST sand on the whole island. In the 10 days we were there, we hit the famous beaches all over the island, and none were as amazingly soft as this one. There is a daily morning talk you can go to in the complex with a guy named RW who can help you book excursions all over the island. Even if you don't want top book anything with him, just go for his knowledge. I didn't purchase anything right away, but came away with 2 pages of notes on suggestions on where to go, best places to eat, coupons for restaurants, cheapest places to shop, etc. And he was totally right on all the suggestions we tried out. When we did decide to talk to him about booking, he took the time to get to know us and suggested a perfect fit for us (younger, adventuresome couple), ones we hadn't seen when searching online and would never have found on our own. I had one question for Don (the owner) while there about an issue I was having, and he called back right away with his suggestion on what it may have been and how to correct it, and said to call him back and he would have someone come over if that didn't fix it. HIs suggestion got us straightened out. Kitchen had everything we needed. All in all, book this if possible. I would certainly tell everyone I know to go here, and will book here my entire time if I ever go back. It was a great middle location to the whole island. Mahalo Donald! Maui Vista, South Kihei (Kamaole I & II Beaches Area), Kihei, South Maui, Maui, Hawaii, USA - No vacation could be more perfect than a vacation on Maui, with the wonderful activities such as parasailing, snorkeling, diving, Zip line, sailing, watching the whales, hiking or riding the volcano or the marine preserve. The only thing that could make it more perfect is this condo at Maui Vista, a central location to nearly anything you can find to do on Maui. Golf: 3 Wailea and 1 Makena course close by.